Friday was the first day warm enough for open-toed shoes; Saturday was the first for bare legs. I spent much of Saturday reading in the park, stretched out on the grass, sipping a strawberry bubble tea. It would appear that the SPF 30 sunscreen I wear every day of the year was just not enough for this weekend's summer-y weather. I got my first sunburn of 2007. I ought to be more careful, considering my family tendency towards skin cancer. Looks like it's time to make the jump from daily SPF 30 to 45. I'm very pink in the face today, apart from the part around my eyes which was shadowed by my big Jackie O sunglasses. My freshly pixied haircut leaves the back of my neck much exposed so I'm singed there, too. Recently, I've been buying up a lot of clothes. It's retail therapy: life isn't so sweet these days but at least I can look good! In the past month or two, I bought four new dresses, a skirt, new jeans and an awesome deconstructed cropped jacket from Montreal designer Eve Gravel. 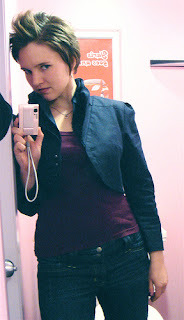 That's me rocking the jeans and the jacket (that was a few weeks ago - my hair is super-short again now). I know I should be sensible and save my limited cash for more important things than pretty garments. I vow to do that... just as soon as I find myself the perfect pair of black heels.